In Working with Cerceris fumipennis Part 1 and Part 2, I talked about the use of this species as a biosurveillance tool for Buprestidae. These wasps are specialist predators of jewel beetles, which they capture almost exclusively and paralyze with their sting to use as food provisions for their offspring in underground nests. I also mentioned that there are other species of Cerceris, each specializing in its own distinct prey group, and at my site in east-central Missouri I found C. bicornis, a weevil specialist, almost as common as C. fumipennis. Thus, when I came upon this particular Cerceris wasp nest, I wondered it I had encountered yet another species in the genus, for littered around it were case-bearing leaf beetles in the genus Neochlamisus. I counted 11 beetles lying on the diggings surrounding this nest, and as is typical with buprestids around C. fumipennis nests these beetles all appeared to represent the same species (I’ve done a little collecting of Neochlamisus beetles in Missouri—the especially bright coppery coloration suggests to me N. platani, a species found on eastern sycamore, Platanus occidentalis). 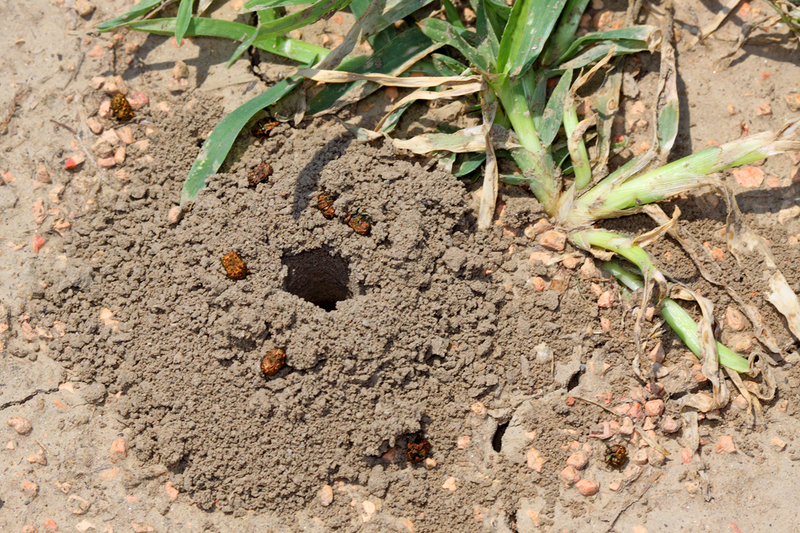 I’ve also noted that C. fumipennis nests littered with beetles on the surface also have beetles—usually of the same species—freshly cached underground, so I decided to dig up the nest to see what might be in it. As I inserted the grass stem and started digging, I heard the distinctive buzzing indicating the wasp was still inside the nest, and when it appeared I noted the distinctive three yellow facial markings that identify it as a female C. fumipennis. As suspected, the nest contained another seven beetles of the same species, and I would later learn that C. fumipennis, while specializing on jewel beetles, does occasionally take other prey. Philip Careless and colleagues recorded two leaf beetles, including Neochlamisus bebbiana, and one weevil as hosts for this wasp at their Working with Cerceris fumipennis website. If my species ID of these beetles is confirmed, this should represent yet another non-buprestid host record for C. fumipennis, although I should also mention that out of several hundred observations this was the only non-buprestid prey I observed around or in a C. fumipennis nest. This entry was posted in Chrysomelidae, Coleoptera, Crabronidae, Hymenoptera and tagged beetles, biosurveillance, entomology, insects, leaf beetles, Missouri, nature, predation, science, wasps. Bookmark the permalink. So much to learn about all these interactions of species in nature! That’s the great thing about insects—still so much that needs to be learned right in our backyards! We have Cerceris maculipennis and Cerceris nigrescens at our Moose Pasture. 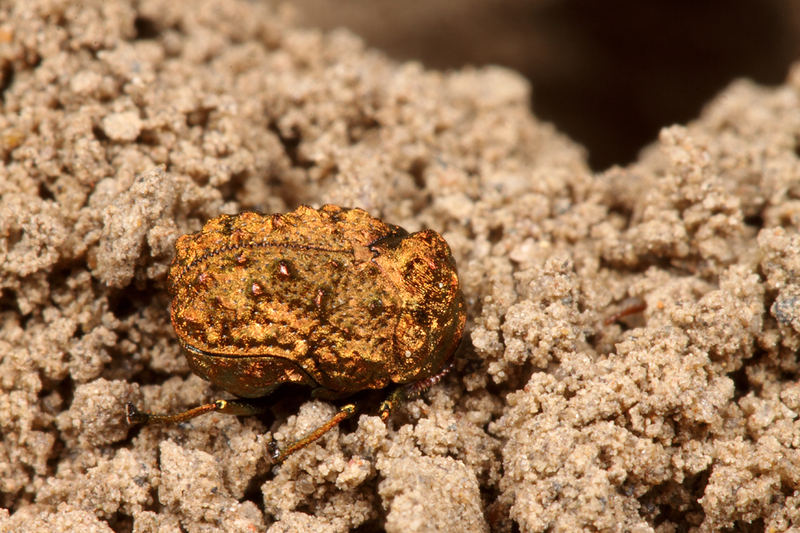 I’m tempted to try and find their nests and find out what weevils may be around, but then I’ve tried the weevil key in Beetles of North America. There must be easier ways to determine what is living where. I’m gonna have to be careful – I’m finding myself tempted to dig up other solitary wasp nests to see what they use as prey. Like I really need another group of interest! Give in to the temptation…we know so little about the biology of solitary aculeate wasps, especially those that are fossorial. I’ve been on the lookout for Methocha, but no luck beyond just the one I found last fall (which I promise I’ll get to you sooner or later). No rush at all. It’s really hit or miss with these — I’ve only found one female this summer despite intensive searching. But really, specimens aside, dig up more nests! Well, I feel better knowing that even the ‘master’ has trouble finding Methocha! Has anyone ever noted Cerceris fumipennis taking ants as prey? In particular, winged ants I think of Camponotus genus but I am not very good at IDing ants. We netted C. fumipennis the other day in cnetral Vermont, multiple females, and what was left in the net after each female (12 prey items were collected) were winged ants.Any info would be appreicated. Thanks so much. Great blog. While some species of Cerceris utilize bees and wasps, C. fumipennis – as far as I can tell – are known only to utilize beetles, and primarily Buprestidae. Arnett (2000) does mention that related wasps in the tribe Aphilanthopini utilize winged ants as prey – could your wasps possibly be one of these species?